It just keeps piling up, literally. 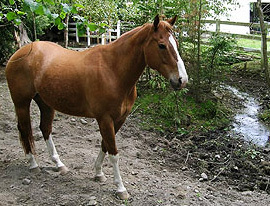 A 1,000 pound horse or cow can produce 50 pounds of manure per day. Livestock and horse manure management is a challenge on most of the properties we visit. A few key practices can help you turn this waste product into an excellent fertilizer source. The manure pile should be located in a dry, flat area as far away from downspouts, ditches, streams, rivers, wetlands, ponds, and the property line as possible. Water plus manure makes a muddy mess for you, and can be a source of water pollution. Another important consideration is to choose a spot that is convenient for you to haul the manure to. If you plan to use a tractor to load, move, and turn the pile be sure to put the pile in a spot that you can access with machinery year round. If you plan to use a wheelbarrow, locate the pile closer to the barn. If your current pile is in a wet, muddy, difficult to access location, tarp the pile and do not add any more manure to it. Create a new manure pile in a better spot, and let the old pile breakdown until you can spread it during the dry season. 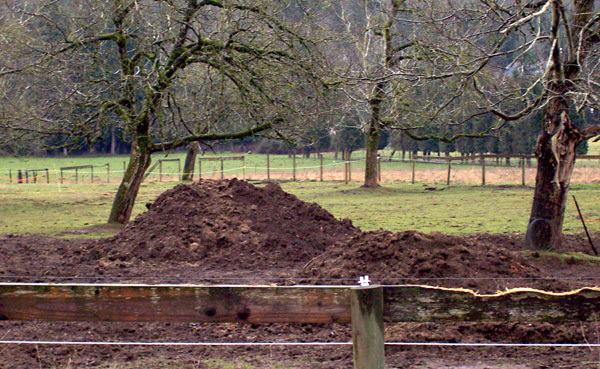 Covering your manure pile will help it decompose faster, keep it drier in the winter, and reduce mud. It also is a crucial step for protecting water quality in our local streams and rivers. Bacteria and nutrients from manure piles can move off your property in rain water and make their way into a stream or river. This is known as non point source pollution and is regulated by the Oregon Department of Agriculture under the Agricultural Water Quality Rules. Many streams in our area drastically exceed the state standard for bacteria. The Department of Environmental Quality estimates that in order to meet the state standard, we need an 86% reduction in the amount of bacteria in some tributaries to the Sandy River (Beaver & Kelly Creeks) and a 78% reduction for portions of the Johnson Creek Watershed (including the upper main stem east of Gresham and Kelley Creek). A tarp is the most inexpensive way to cover your pile. Plan to weight the tarp down with tires, boards, or sand filled milk jugs to keep it in place. Stapling a board into one end of the tarp allows the tarp to be rolled back more easily when you need to add to the pile. Some landowners have found that they prefer to have two tarped piles; one that they add to and one they let compost. Others have built three sided bins to support the sides of the pile, with a tarp over the top. Since we live in a windy area, many landowners have found that the easiest way to cover the manure pile is to build a small shed. The shed should have a metal roof and three walls. A concrete floor is optional, but it will make emptying and turning the piles much easier. 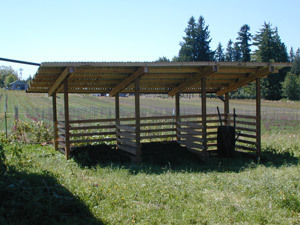 The shed can be divided into two or more bins to allow you to fill one bin and let the manure compost while you fill the others. Contact us if you need help designing a manure storage shed. We have example designs to give you some ideas. The USDA Natural Resources Conservation Service has developed the following calculation to help you determine the volume of your manure pile. They recommend a storage area that is big enough to stockpile 6 months worth of manure during the wet months. Volume of manure produced in 6 mo. Volume of bedding for 6 mo. These calculations assume that you are collecting manure from stalls, heavy use areas, and pastures and piling it in one spot. Use the last formula to determine the square footage needed for manure storage. Pile height is usually limited by the equipment used. If you use a wheelbarrow to haul manure to the storage pile, be practical about how high you can pile it. A pile height of 3 to 4 feet is practical with a wheelbarrow; a higher height will be possible if you use a tractor with a front end loader. The pile must be at least 3 feet high to compost properly. There are two approaches to manure storage; a passive system or an active composting system.The manure will naturally breakdown either way. The advantages of composting are less odor, the pile size will decrease more quickly, and the heat from the pile will tend to kill insect eggs, larvae, weed seeds, and pathogens. Composting requires air, heat, and moisture. The best way to get air into the pile is to turn it regularly. Even if you only turn the pile once or twice a year, you will speed up the decomposition process which will help the pile shrink. Turning the pile also helps maintain the proper temperature. If you can’t turn the pile because you don’t have a tractor and the thought of turning the pile with a shovel is overwhelming, you can get some air into the pile by placing 4 inch perforated pipes across the pile every 2 feet of pile depth. The ends of the pipe must extend past the edge of the pile. A minimum pile size of 3 feet tall by 3 feet wide will help achieve the proper composting temperatures. Keep the pile moist, but not saturated. These practices will help turn manure into an excellent source of nutrients and organic matter for your pastures and gardens. Manure should be applied when the weather is dry and plants are actively growing. Visit Manure Connection to if you have manure to give away, or are looking for fresh or aged manure!